WELCOME TO A HOPEFULLY RARE SOLO EPISODE OF TALES OF THE JUSTICE SOCIETY OF AMERICA! Scott is on hiatus but that hasn’t stopped Mike from recording a brand, spanking new episode of TALES. There’s no ALL-STAR SQUADRON talk this time out because Mike wants to hold off on that series until Scott gets back. Instead Mike has gone back to the very beginning of Earth-2 with THE FLASH #123, which features the classic “Flash of Two Worlds” story. In that epic tale Barry Allen winds up on a world very much like his own but slightly different. On that world there is no Central City. Instead there is Keystone City, home of Jay Garrick the Golden Age Flash! Barry gets to meet his boyhood hero and even team up with him against the Thinker, the Fiddler and the Shade! It’s a fun story that got the whole multiverse ball rolling. 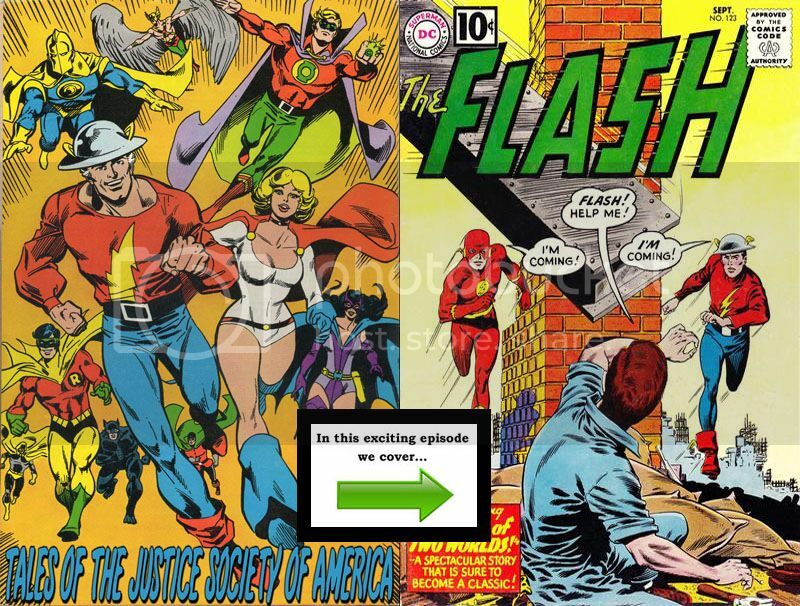 After giving you the lowdown on the story Mike has some notes to go through including the shocking absence of a certain term from the story, why Jay Garrick was so darn trusting and which villain Mike changed his mind about. Mike hopes that you like the show and will stick with the program while Scott is gone. Next week: Flash #129 and possibly #137! Ok, here’s the premise…….. Scott has read Grant Morrison’s dark and dreary “Arkham Asylum” numerous times over the past twenty years. And despite continually hearing how great it is for two decades now, he JUST… CAN’T… SEE IT! So, to perhaps help “shine a little light”, he has invited special guest CHRIS JOHNSON, die-hard Grant Morrison fan, to join him for this very special episode and maybe, just maybe, help Scott UNDERSTAND just what it is about this supposed masterwork. Insightful and entertaining conversation ensues, but…will Scott’s opinion be swayed? Join Alec Berry and Scott H. Gardner as they travel ‘Back to the Bins’ to re-discover and re-connect with that unique brand of fun and excitement that can only truly be found in good ol’ fashioned random Comic Book back issues! !